It's been three years since Prashanth Tharani competed in a sprint race, with the Chennai-based racer having switched to endurance racing for the last few seasons. 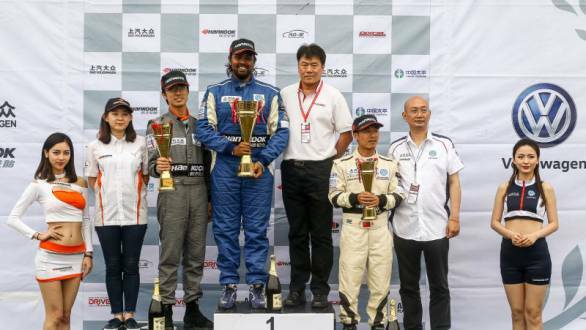 However, when Dream Racing Team Asia approached him to compete in the premier class of the Volkswagen Polo R Cup in China, Tharani jumped at the opportunity. The first day started out with the track damp and greasy. Despite this Tharani and his team decided to take a gamble and opt for slick tyres. It turned out to be a good move too, because the three cars ahead of him were all on slicks. Tharani had qualified fourth for Race 1, and when it was declared that the race would begin with a rolling start was quietly confident. After all, he'd grown rather used to rolling starts thanks to his endurance racing experience. The start of Race 1 went well for Tharani, and by the second corner he was already making a move for third place. By the seventh corner he'd managed to move into second place. After that it was all a matter of keeping as close as possible to the guy in front. Tharani then began to close up to the driver in the lead, and made a move at the second corner, a tight left hander. With the pair of them going side by side during the subsequent right and left handers, Tharani decided to back off especially since the other racer was on the inside line. The following lap though, Tharani was able to make the move stick and get past him on the fifth corner. With the lead in his hand he stayed calm and focussed, tried to save his tyres as much as possible for the race, and finished first with a lead of approximately 2.8 seconds. Race 2, however, didn't go as well as he would have liked. Tharani started from 11th position, and managed to make up a few places at the start, moving up to seventh by the end of lap 1. A Safety Car period followed, after Tharani's Dream Racing Team Asia team-mate had a huge accident. After the Safety Car pulled into the pitlane though, he started working his way up the order and moved into third. With three laps remaining, and realising that he was the only driver on track with old tyres, Tharani decided to drive smoothly. With one lap to go, he'd managed to attempt a move for first position. However, disaster struck and his car lost drive. This meant that he had no choice but to coast into the pitlane. It was race over. "Going into the weekend, I had a lot of doubts in my head about my preparedness for such an event. While I have been racing more powerful cars for the last 3 years, the fact that I've not participated in a sprint race in the longest time was always at the back of my head! As I made one move after the other during the races, my confidence in myself grew and I found that I hadn't lost any of my sharpness!" Tharani said of his race weekend. Tharani will also compete for Zest Race Car Engineering, and will drive a Seat Eurocup car for them in the Creventic Endurace races in Barcelona and Czech Republic later this year.